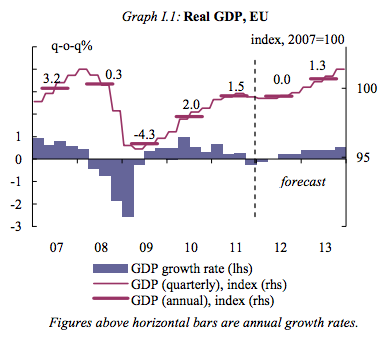 The European Commission just came out with a spring 2012 forecast for the EU economy. You can see the main point above in the chart for GDP and forecast. The good news is that Q2 will be the last quarter of contraction: recovery will begin forthwith next quarter. The forecast mild recovery is predicated on a return of confidence, and thus on the assumption that the challenges faced by the euro area, notably the still on-going sovereign-debt crisis and the fragile state of the EU banking system, will be successfully and sustainably overcome. In particular the main mechanism identified to initiate recovery is that a falling Euro will help European competitiveness and drive greater demand for European exports. Overall, domestic demand is unlikely to support GDP growth in 2012, as the process of deleveraging continues across the sectors of the economy. Banks need to further strengthen their balance sheets and tight credit conditions are expected to weigh on consumption and investment. Private investment is currently still contracting and is expected to be a drag on GDP in 2012. On balance, net exports of goods and services are expected to support economic growth over the forecast horizon. The consolidated current-account balance is predicted to gradually improve over the forecast horizon in the euro area and the EU. And as long as the weak are going to the wall, the whole area will continue to be riven by uncertainty about the future viability of the entire project, while will inhibit investment and consumption alike. I just found out how to leave a comment. So I had a question about this crisis and don't know where to get the data. I'd like to see a graph with on one side the percentage of the GDP that is used to buy oil products, and on the other side the percentage of grow of the different countries of the EU. If you know where to find the data, I'd be very happy. I find the comment "there's only so much olive oil you can buy" quite irritating and a sign of one of the problems of the popular analysis of the euro crisis, which lumps all Mediterranean countries together as if they were one and the same. Only one country had an overspending problem, and that was Greece (on the other hand, Greeks work the longest hours in the world after Koreans, so much for lazyness). Spain had shining public finances and a huge housing bubbled financed by German capital. And Italy is the 7th largest manufacturing economy in the world, and the second largest in Europe ahead of France and the United Kingdom. The fifth largest, if you exclude mining (which pushes Russia and Brazil ahead).